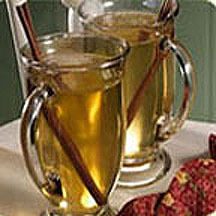 A delicious warm, buttery and spiced wassail made with white cranberry juice and sweetened with brown sugar. Combine juice, cinnamon sticks and ginger in a large saucepan. Heat to boiling, reduce heat and simmer 10 minutes. Put 1 teaspoon each of butter and brown sugar in 6 large mugs. Pour hot juice drink into each mug. Stir gently. Add 1/2 ounce almond liqueur to each mug if desired. Garnish with a cinnamon stick.